The Lasallian Outreach Collaborative (L.O.Co.) is a weekly community service organization which partners with local community-based organizations in the Bronx, and greater NYC area. Students involved in L.O.Co. participate in ongoing, sustainable, weekly service work throughout the year with various local community organizations, working to create lasting social change by responding to the expressed needs of our community partners (see full list below). All current Manhattan College students are encourage to participate in the program. To get started, you should make an appointment with the Coordinator of Community Partnerships & Service to fill out the necessary paperwork, learn about transportation options, and get connected with other current student volunteers! 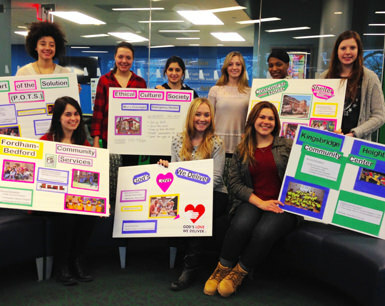 Manhattan College continues to build mutually-beneficial partnerships with local community-based organizations. Our students involved in the Lasallian Outreach Collaborative (LOCo) work with these partners in a variety of volunteer roles. Altagracia Faith and Justice Works empowers lay leaders to put their faith into action and promote social justice through faith formation, leadership development, service and advocacy opportunities to effect concrete local change in Northern Manhattan. Volunteers with Altagracia support various programming and advocacy efforts. Ariva's free income tax preparation program is an IRS-certified and supervised program offering high quality tax services to low-income New Yorkers. Volunteers at ARIVA receive free training and then put their skills to use helping with income tax preparation for low-income New Yorkers. Brilla College Preparatory Charter Schools help students to grow intellectually, socially, and physically into young men and women of good character and spirit, and to be prepared for excellence in high school, college and beyond. Volunteers at Brilla support the El Camino program, a Catholic faith formation, character development, and academic support through a fun and enriching extended day program. BUILD is dedicated to proving the power of experiential learning through entrepreneurship, and igniting the potential of youth in under-resourced communities, and equips them for high school, college, and career success. Volunteers are matched with a team of 4-8 youth entrepreneurs for one academic year, who work together to create strong relationships and help students develop critical 21st century skills. Concourse House offers a temporary home to approximately 42 women and their children. Our volunteers typically assist in the childcare center or in the after-school program with homework assignments and activities. The Riverdale-Yonkers Society for Ethical Culture runs a men’s overnight emergency shelter on Mondays. Our volunteers support the shelter by setting up cots, preparing food and providing hospitality for the guests. F.B.C.S. provides social services to families in Fordham Bedford Housing Corporation buildings and the surrounding community. Volunteers with F.B.C.S. as New Walton and West Farms provide homework help and recreation for youth in the afterschool program. Volunteers with F.B.C.S. at Serviam Gardens assist with adult education, including English as a Second Language (ESL) and Basic Computer Skills classes. Volunteers also help with recreation activities for residents such as bingo and dominoes games, as well as arts & crafts. God’s Love We Deliver is a meal assistance program for the elderly, sick and homebound. Our volunteers deliver meals to individuals and families needing assistance around the Bronx community. Kingsbridge Heights Community Center's mission is to build on the strengths of residents in our diverse community, enabling them to effect change, if needed, and improve the quality of their own lives, families, and communities. Volunteers assist by acting as mentors and tutors for students for schoolwork and recreation. After School Program - offers structured educational and recreational activities for children in grades K-5. Tween Program - offers activities and educational opportunities for youth in grades 6-8. College Directions Program - provides Bronx high school students with help applying to colleges and universities. The Methodist Home for Nursing and Rehabilitation assists seniors in need of both short-term rehabilitation and long-term nursing care. Our volunteers work directly with residents, or assist professional staff, to achieve the Home’s mission of providing the best possible care and quality of life. The Northwest Bronx Community and Clergy Coalition has a tradition of broad-based, membership driven, social justice community organizing. Volunteers with SBU support young people ages 14+ academically, as well as with the college application process, and in leadership training programs that will enhance teens understanding of oppression and ways to organize around those issues. Part of the Solution (POTS) provides a number of services to local individuals and families in need, including meals, a food pantry, barbershop, clothing room, shower facilities, medical clinic and more. POTS relies on volunteers to help run its Community Dining Room, which provides meals to people in need, as well as the Family Club, which provides homework help for children and cooking classes for adults. The Passage of Hope (Camino de Esperanza), a program run by nonprofit Leake & Watts, provides short-term care and assistance to undocumented migrant children who have come to the United States from other countries without an adult guardian. Our volunteers provide tutoring and assistance learning the English language. Renaissance Youth Center is on a mission – to empower youth to maximize their potential, create a positive change in their communities, and contribute to the collective voice of inner-city youth through education, music and sports. Volunteers assist with basketball programming for autistic youth and children between the ages of 3-6 years on Saturday afternoons. University Neighborhood Housing Project (UNHP) has been a resource for residents of the Northwest Bronx for 30+ years by providing financial education, foreclosure prevention, free tax preparation and small business help. Each spring, our volunteers receive free training and put their accounting skills to use helping Bronx residents with income tax preparation and/or translation services while their taxes are being prepared by another volunteer. Depending on the time, select service sites have MC van transportation to and from campus. All partner sites are accessible via public transportation. A few sites are also within walking distance from campus. Students who participate in L.O.Co. visit our partner sites and serve between 2-5 hours each week (including transportation). CMSA and our Community Partners prefer students commit to a weekly basis so that we can more readily meet the needs of our Community Partners, as well as develop relationships with the people with whom we are working. What else is required of me for service? Most service sites have an initial orientation to familiarize you with the work of the agency and skills you need to be an effective volunteer. Many sites also require a volunteer application to be filled out for their records, as well as a background check if working with children. Contact the Coordinator of Community Partnerships & Service to learn more or visit the Social Action Suite in the Student Commons, 2nd Floor, Suite 203! Students on the L.O.Co. Leadership Team serve as liaisons to our Community Partners and meet weekly to develop programming and reflection for students involved in L.O.Co. Our community partners are in need of certain goods. Learn more about how you can help.